Prostate cancer is the one of the commonest cancers in American men and the second leading cause of cancer deaths. In 2012, the US Preventative Task Force recommended against the prostate specific antigen-based screening test for prostate cancer due to overtreatment of low-risk disease and lack of impact on outcomes. In the general population, African-American men have 60% higher incidence and 200-300% greater mortality rate from prostate cancer than Caucasian men. Additionally, many veterans have been exposed to chemicals that increase incidence of high-risk prostate cancer. Considering these factors, we examine whether or not it is appropriate to screen African-American veteran males for prostate cancer. We performed a PubMed and Google Scholar search using pertinent terms, such as African-American veteran, prostate cancer, mortality, PSA density, molecular markers, and Agent Orange. The articles that were relevant to the clinical, molecular, social, and health policy aspects of the diagnosis and treatment of prostate cancer in African-American veterans were analyzed. The data was then summarized. After surveying the literature, there were several areas where the African-American veteran population differed from their Caucasian counterparts: Incidence, clinical course, social differences, PSA levels, mortality rate, and molecular markers. A subset of the veteran population was also exposed to Agent Orange, which has been shown to increase the incidence of aggressive forms of prostate cancer. Lastly, the current USPTF guidelines recommending against prostate cancer screening were based on patient cohorts containing disproportionately low numbers of African-Americans, limiting their extension to the African-American veteran population. After reviewing and summarizing the literature, we contend that a need exists to develop and implement more targeted prostate cancer screening guidelines for African-American veterans. Prostate cancer is the commonest form of cancer, other than skin cancers, in American men and the second leading cause of cancer deaths . African-American men have the highest incidence of prostate cancer and are more likely than Caucasian men to be diagnosed with an advanced form of prostate cancer . In 2016, it is estimated that there were 180,890 new diagnoses of prostate cancer and 26,120 deaths attributable to prostate cancer. Age and race are the greatest risk factors for prostate cancer. In African-American men, however, the incidence of prostate cancer is almost 60% higher, and the mortality rate is two- to three-times greater than that of Caucasian men . Patient comorbidities also play a role in treatment and prevention of the disease. The Veteran's Health Administration (VHA) is an unbiased, race-and-color blind, equal and open access, single-payer, government-run healthcare system. The VHA healthcare system is classified as a federal, veteran-specific, national healthcare system because the Federal government owns the majority of healthcare delivery sites, employs the healthcare providers, and directly provides the majority of healthcare services to veterans . Any veteran eligible for care within the VHA system must meet the statutory definition of a "veteran", meet the statutory definition of "active duty", and serve/have served a minimum period of "active duty". Based on the National Center for Veterans Analysis and Statistics, the projected total number of veterans in 2016 was 21,368,156, of which Black veterans represented approximately 13% . Based on SEER data from 2010-14, the age-adjusted rate of new cases and deaths from prostate cancer in the general population were 119.8 and 20.1 per 100,000 men per year, respectively . Based on data from 2012-14, approximately 11.6% of men will be diagnosed with prostate cancer in their lifetime, and in 2014, there were roughly 3,085,209 men living with prostate cancer in the United States . In 2012, the US Preventive Task Force (USPTF) recommended against the use of prostate specific antigen (PSA)-based screening test for prostate cancer. The VHA System has integrated electronic records, so it is possible to review these records at the national level. Over 80% of prostate cancers diagnosed in the Veterans Health Administration are localized to the prostate gland and only 5% are metastatic . Thus, the vast majority of the patients diagnosed are eligible for definitive treatment. Medical and professional organizations, such as the American Urological Association (AUA), USPSTF, and VHA, have all published guidelines for prostate cancer screening. The VHA does not recommend prostate cancer screening with PSA for men ages 45-70 but recommends that any decision to initiate or continue prostate cancer screening with PSA for any veteran should be based on a decision between the patient and his provider . Previously, we reviewed data on African Americans in the general population and concluded that new guidelines needed to be implemented for screening African-Americans . Here we review the issues related to African-American veterans. We used combinations of these words to find peer-reviewed publications with information regarding African-American veterans and prostate cancer. The articles that were relevant to the clinical, molecular, social, and health policy aspects of the diagnosis, and treatment of prostate cancer in African-American veterans were analyzed. The data was then summarized. In the general population, African-Americans have a much higher prevalence of prostate cancer. Within the veteran population, a striking difference in the prevalence of prostate cancer is apparent once again. Prostate cancer accounts only for 28.9% of all cancers in White veterans but in Black veterans it represents 42.7% of all cancers . African-American veterans also tend to present with more advanced disease. Indeed, one study based on data from the VHA found that while only 26% of White veterans presented with involved lymph nodes or distant metastases, the number of Black men presenting with equivalent disease was 52% . Along with the higher incidence and prevalence noted in the African-American male population, the clinical course of prostate cancer in African-American men differs from that of the Caucasian population. Early in the disease course, the clinical characteristics of prostate cancer in African-American men and white men are similar, but on autopsy of men who had prostate cancer but died of unrelated causes, it was found that African-American men carried a higher prostatic tumor volume and were 4-times more likely than White men to have developed aggressive, metastatic disease . These findings support the hypothesis that prostate cancer in African-American men may have a higher growth rate or transforms to more aggressive forms earlier than in White men. Since the 5-year survival rate among men with distant metastases is only 29.3%, it is important that aggressive disease is detected early in its course . These findings also explain, in part, why African-American men are more likely to present at a later stage than Caucasian men of similar age. There also seem to be multiple genetic components contributing to the differences seen in the clinical course of disease of African-American men compared to Caucasian men. In individuals with prostate-cancer-negative biopsies for example, the PSA levels of the African-American men were 1.8-fold higher than those found in Caucasian men, even after controlling for prostatic volume . Also, it has been suggested that African-American men are more susceptible to prostate cancer because of shorter repeat lengths in comparison to Caucasians and Asians, which results in greater androgen receptor activity . Lastly, several risk-associated single nucleotide polymorphisms (SNPs) are overexpressed in African-American men, which are discussed in-depth later . There are several social differences within the African-American population that can potentially contribute to poorer outcomes relative to Caucasians and Asians. First, there is a discrepancy between Caucasian and African-American males in insurance coverage. About 90% of Caucasian men over 50 years of age have health insurance, but 81% of similar age group African-American men carry health insurance . Second, poor health seeking behaviors in African-American men can contribute to delayed diagnosis and more advanced disease at diagnosis . Additionally, when compared to Caucasian men with similar stages of disease, African-American men are less likely to be treated . Delayed diagnosis coupled with lack of treatment can thus significantly affect the outcome of African-American men with prostate cancer. Third, many barriers traditionally associated with lower socioeconomic status are also major contributors of poorer health outcomes [13,17]. PSA is a protein antigen produced only by prostate gland cells and released into the blood in especially large quantities when normal prostate tissue is disrupted (e.g. cancer, infection). Generally speaking, higher serum PSA levels signify an abnormality within the prostate gland, although many factors are known to affect PSA levels. One study evaluated the serum PSA levels of 752 men of a bi-racial veteran population . In this specific population, the mean PSA level in men without prostate cancer was 7.97 ng/ml compared to the 4.94 ng/ml mean in a comparable White veteran population without prostate cancer . Generally, PSA levels higher than 4 ng/ml are associated with increased risk of prostate cancer although prostate cancer is 1.4-times more likely to develop in men with a PSA level greater than 2.5 ng/ml . While a PSA level of 2.5 ng/ml is a reasonable predictor of prostate cancer diagnosis within four years, a lower threshold of 1.9 ng/ml can potentially be used as a predictor for African-Americans . While African-American men tend to have higher PSA levels, they are just as likely as their White veteran counterparts to get their PSA levels tested. African-Americans, in general, are three times more likely to die from prostate cancer than other races. However, the mortality rates for African-American and Caucasian veterans were similar in a study conducted in 2013 at the Connecticut VHA System. Similarly, a team with the VHA and UCLA studied more than 1,200 California veterans and found "no significant differences in tumor burden, treatment choice or survival for African-Americans or survival outcomes between African-Americans and Caucasians cared for in the equal-access VHA system setting ". There was, however, a difference found in the private sector. Five reports have documented similar mortality rates between African-American and Caucasian men in equal-access systems . The purpose of screening for prostate cancer is to reduce the mortality rate related to prostate cancer, but it was estimated that screening only benefited 0-1 men out of every 1,000 screened . In addition to having a low influence on outcomes, there was a high rate of false-positive tests, which led to an over diagnosis of prostate cancer in 17-50% of cases . Although this has lead to over-treatment in the general population, African-American males are under-treated. In 2008, the USPSTF took a two-tiered approach to prostate cancer screening. The guidelines noted that the screening of men under the age of 75 had Grade I support - which meant that there was insufficient knowledge of risks to support screening. However, in men over 75 screening was not recommended based on Grade D evidence - meaning there was a moderate or high risk of certainty that the service had no net benefit or had an unfavorable risk/benefit ratio . The current USPSTF guidelines recommend against prostate cancer screening for men of all ages, regardless of race, and the recommendation is considered to be supported by Grade D evidence. While the lifetime risk of prostate cancer is 15.9%, the risk of dying is only 2.8%, suggesting that the majority of prostate cancer have favorable outcomes, regardless of early detection or treatment . The current guidelines, however, were based on the findings of two studies - the Prostate, Lung, Colorectal, and Ovarian Cancer Screening Trial (PLCO) and the European Randomized Study of Screening for Prostate Cancer (ERSPC). The PLCO trial noted that men in their screened group had a 12% higher incidence of prostate cancer but an equal death rate . Finding that screened men had similar outcomes to unscreened men but had been exposed to additional pain and bleeding associated with screening and follow-up led the authors to conclude that there was no net benefit to screening for prostate cancer in their population. However, the PLCO trial cohort only included ~4% African-American men, which raises questions on the ability of these results to be generalized to the African-American population as a whole . After 13 years of follow-up, the ERSPC has displayed that PSA screening leads to a substantial decrease in prostate cancer mortality . In their most recent update, they reported that in order for 1 death from prostate cancer to be prevented, an additional 27 cases of prostate cancer had to be first diagnosed and 781 individuals needed to be screened . Although specific demographic information was not reported, this study was conducted in eight European countries which traditionally did not have large populations of African descent, which again introduces uncertainty of their findings' applicability to the general African-American population. The Prostate Cancer Intervention Versus Observational Trial (PIVOT) is another study related to these outcome measures. This study compared expectant management of prostate cancer with radical prostatectomy and found no difference in outcomes between White and African-American males . The comparable outcomes in this study are concerning despite these findings, African-American men generally have an increased prostate cancer mortality. Thus, although one-third of the PIVOT trial participants were African-American males, the two arms of this study may not represent the patterns of practice or that the study may have been inadequately powered to detect racial differences. Certain molecular markers have also been linked to the clinical course and disease outcomes in men with prostate cancer [26,27]. For instance, several studies have identified multiple single nucleotide polymorphisms (SNPs) that are preferentially expressed in African-Americans . Approximately 100 genes containing SNPs have been linked to an increased susceptibility to prostate cancer . Single nucleotide polymorphisms are especially valuable in disease detection, monitoring, and screening because they are stable throughout the lifetime of the individual and are not affected by external factors, such as lifestyle . Several studies have suggested that African-American males are at increased risk of prostate cancer, in part, because they possess many of these SNPs [28,29]. For instance, Xu, et al., showed that 17 of 20 SNPs are more common in African-American males, and of the 17 SNPs, 2 were associated with a higher risk of prostate cancer . Freedman, et al., showed that a 3.8MB interval on chromosome 8q24 was associated with prostate cancer and was found mainly in African-Americans . Families with a history of particular allelic variants within this interval were 9.46 times more likely to develop prostate cancer than those without these variants . In addition, several biomarkers have shown differential expression between aggressive and non-aggressive forms of prostate cancer . Unfortunately, these molecular findings have not yet been incorporated into screening protocols. In addition to increasing the accuracy and validity of screening, incorporating biomarkers would also decrease unnecessary invasive procedures which would positively impact the net benefit of screening . In short, effective screening for prostate cancer in all males will need to incorporate these molecular findings into protocols that successfully identify individuals at increased risk for aggressive prostate cancer. Such updated guidelines would allow for more precise identification of aggressive and metastatic disease, improve survival outcomes, and lower overall treatment costs. About three million Americans served in the armed forces in Vietnam during the 1960s and 70s. During this period, the military used large amounts of a defoliant called Agent Orange to eliminate forest cover. In a study conducted at Portland Medical Center and Oregon Health Sciences University, it was found that veterans exposed to Agent Orange were not only more likely to develop prostate cancer, but also more likely to develop a more aggressive form of the disease . Agent Orange exposure is associated with a 52% increase in the detection of prostate cancer and a 75% increased risk of high-grade prostate cancer . There was, however, no increase in the risk of low-grade prostate cancer. Men exposed to Agent Orange were also diagnosed at a younger age compared to men who were not exposed to the carcinogen. In conclusion, exposure to Agent Orange appears to increase the detection of prostate cancer and incidence of high-grade prostate cancer; however, one must be cautious that these findings are not, at least partially, explained by selection bias . There is an immense need to implement more targeted prostate cancer screening guidelines for African-American males within the nation-wide VHA system. African-American male veterans have a higher incidence of prostate cancer and present at a higher stage than their peers. Prostate cancer in these men tends to be more aggressive at presentation and/or transforms to more aggressive forms earlier. Social factors, such as delayed diagnosis and lower rates of treatment, can all contribute to worse disease outcomes. In addition, the exposure of many veterans to Agent Orange has been shown to increase the incidence of high-grade prostate cancer. The current USPSTF guidelines recommending against prostate cancer screening were based on trials that were not fully generalizable to the African-American population because such individuals were underrepresented in the investigational cohorts. In including techniques that detect molecular markers, future guidelines would be able to identify patients at risk of the more aggressive forms of prostate cancer and potentially decrease prostate cancer mortality, while minimizing the rates of false-positive tests that may previously have led to unnecessary treatment of benign disease. Figure 1 below represents a hypothetical screening flowchart. In future reports, we will investigate how patient comorbidities may impact prostate cancer incidence and mortality rate. The most prevalent comorbid disease with prostate cancer is cardiovascular disease. This also happens to be the number one cause of death in the African-American population. Investigating these links and aggressive management of the comorbidities may positively impact the morbidity and mortality associated with prostate cancer. Although the above discussion focuses on African-American veterans, much can be applied to the general African-American community . Odedina FT, Akinremi TO, Chinewundoh F, Roberts R, Yu D, et al. (2009) Prostate cancer disparities in Black men of African descent: a comparative literature review of prostate cancer burden among Black men in the United States, Caribbean, United Kingdom, and West Africa. Infect Cancer Agent 4: 2. Administration VH (2016) Veterans Health Administration. Planning OO (2016) National Center for Veterans Analysis and Statistics. (2016) Surveillance, Epidemiology, and End Results Program (n.d.). (2009) GPRA Report on Prostate Cancer. Shenoy D, Packianathan S, Chen AM, Vijayakumar S (2016) Do African-American men need separate prostate cancer screening guidelines? BMC Urol 16: 19. Brawn PN, Johnson EH, Kuhl DL, Riggs MW, Speights VO, et al. (1993) Stage at presentation and survival of white and black patients with prostate carcinoma. Cancer 71: 2569-2573. Powell IJ, Bock CH, Ruterbush JJ, Sakr W (2010) Evidence supports a faster growth rate and/or earlier transformation to clinically signifiant prostate cancer in black than in white American men, and influences racial progression and mortality disparity. J Urol 183: 1792-1796. Ries LAG, Melbert D, Krapcho M, Mariotto A, Miller BA, et al. (2007) SEER Cancer Statistics Review 1975-2004, National Cancer Institute, Bethesda. Henderson RJ, Eastham JA, Culkin DJ, Whatley T, Mata J, et al. (1997) Prostate Specific Antigen (PSA) and PSA Density: Racial Differences in men Without Prostate Cancer. J Natl Cancer Inst 89: 134-138. McIntosh H (1997) Why Do African-American men Suffer More Prostate Cancer? J Natl Cancer Inst 89: 188-189. Du XL, Fang S, Coker AL, Sanderson M, Aragaki C, et al. (2006) Racial disparity and socioeconomic status in association with survival in older men with local/regional stage prostate carcinoma: findings from a large community-based cohort. Cancer 106: 1276-1285. (2009) Behavioral Risk Factor Surveillance System. Center for Disease Control and Prevention. Powell IJ, Heilbrun L, Littrup PL, Franklin A, Parzuchowski J, et al. (1997) Outcome of African-American men screened for prostate cancer: the Detroit Education and Early Detection Study. J Urol 158: 146-149. Underwood W, De Monner S, Ubel P, Fagerlin A, Sanda MG, et al. (2004) Racial/ethnic disparities in the treatment of localized/regional prostate cancer. J Urol 171: 1504-1507. Ward E, Jemal A, Cokkinides V, Singh GK, Carinez C, et al. (2004) Cancer disparities by race/ethnic and socioeconomic status. CA Cancer J Clin 54: 78-93. Sutton SS, Crawford ED, Moul JW, Hardin JW, Kruep E (2016) Determining optimal prostate-specific antigen thresholds to identify an increased 4-year risk of prostate cancer development: an analysis within the Veterans Affairs Health Care System. World J Urol 34: 1107-1113. Office of Research & Development. Graham-Steed T, Uchio E, Wells CK, Aslan M, Ko J, et al. (2013) 'Race' and Prostate Cancer Mortality in Equal-access Healthcare Systems. Am J Med 126: 1084-1088. Final Recommendation Statement: Prostate Cancer: Screening. U.S. Preventive Services Task Force. SEER Cancer Statistics Review, 1975-2006. National Cancer Institute. Andriole GL, Crawford ED, Grubb RL, Buys S, Chia D, et al. (2012) Prostate cancer screening in the randomized Prostate, Lung, Colorectal, and Ovarian Cancer Screening Trial: mortality results after 13 years of follow-up. J Natl Cancer Inst 104: 125-132. Schröder FH, Hugosson J, Roobol MJ, Tammela TL, Zappa M, et al. (2014) Screening and prostate cancer mortality: results of the European Randomised Study of Screening for Prostate Cancer (ERSPC) at 13 years of follow-up. Lancet 384: 2027-2035. Wilt TJ, Brawer MK, Barry MJ, Jones KM, Kwon Y, et al. (2009) The Prostate cancer Intervention Versus Observation Trial:VA/NCI/AHRQ Cooperative Studies Program #407 (PIVOT): design and baseline results of a randomized controlled trial comparing radical prostatectomy to watchful waiting for men with clinically localized prostate cancer. Contemp Clin Trials 30: 81-87. Hicks C, Koganti T, Giri S, Tekere M, Ramani R, et al. (2014) Integrative genomic analysis for the discovery of biomarkers in prostate cancer. Biomark Insights 29: 39-51. 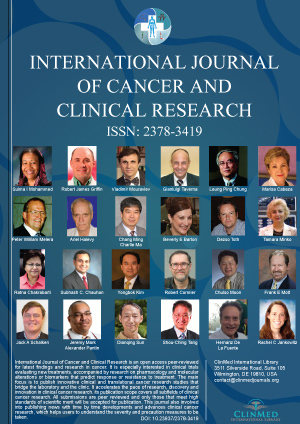 Helfand BT, Catalona WJ, Xu J (2015) A genetic-based approach to personalized prostate cancer screening and treatment. Curr Opin Urol 25: 53-58. David S, Chan DW (2014) Biomarkers in prostate cancer: what's new? Curr Opin Oncol 26: 259-264. Kader K, Sun J, Reck B, Newcombe PJ, Kim ST, et al. (2012) Potential Impact of Adding Genetic Markers to Clinical Parameters in Predicting Prostate Biopsy Outcomes in men Following an Initial Negative Biopsy: Findings from the REDUCE Trial. Eur Urol 62: 953-961. Xu J, Kibel AS, Hu JJ, Turner AR, Pruett K, et al. (2009) Prostate cancer risk associated loci in African-Americans. Cancer Epidemiol Biomarkers Prev 18: 2145-2149. Freedman ML, Haiman CA, Patterson N, McDonald GJ, Tadon A, et al. (2006) Admixture mapping identified 8q24 as a prostate cancer risk locus in African-American men. Proc Natl AcadSci U S A 103: 14068-14073. Ansbaugh N, Shannon J, Mori M, Farris PE, Garzotto M (2016) Agent Orange as a risk factor for high-grade prostate cancer Filters. Cancer 119: 2399-2404. Srinivasan Vijayakumar, UMMC Radiation Oncology, 2500 N State St, Jackson, MS 39216, USA, Tel: (601)-815-6886. © 2018 Reddy A, et al. This is an open-access article distributed under the terms of the Creative Commons Attribution License, which permits unrestricted use, distribution, and reproduction in any medium, provided the original author and source are credited.